A few times I have found myself in Outlook Web Access, unable to figure out how to open a shared mailbox. In the desktop version of Outlook, you can access folders in the left hand navigation bar, or from the File menu. It’s is a little bit different in OWA for Office 365 or Exchange 2013/2016. Here is a quick set of instructions on how to open a shared mailbox, or an any user mailbox to get access to the folders in that mailbox. Office 365 OWA really simplifies the user experience. That’s good but it is easy to miss out on certain navigation elements. This post will cover two methods to open a Microsoft Exchange Shared mailbox. The first will add the new mailbox and folders to your existing OWA view. The second method will open the mailbox in a separate browser tab. This first method of opening a shared mailbox will add the shared folders to your existing folder navigation. When you open OWA, you should have a navigation view as shown below. Hit the More menu in the navigation tree as shown by the red arrow below. The next step will be to right click on the menu with the name of your mailbox and choose Add shared folder as shown in the red circle above. In the add shared folder dialog box, (2) type the name or email address of the shared mailbox you would like to open. In the example below, we will connect to a generic shared mailbox, rather than a user’s mailbox. Click add the Add button as indicated by red circle (3) shown below. You should be able to see the newly added shared mailbox in the left navigation pane (4). Using Outlook Web Access, this method will allow you to open the shared mailbox in a separate browser window. As shown in the previous diagram, Circle (5), open the My Accounts menu by clicking your name. After the menu appears, click Open another mailbox (5). In the add shared folder dialog box, type the enough of the name or email address of the shared mailbox until the desired mailbox shows up in the list of results. 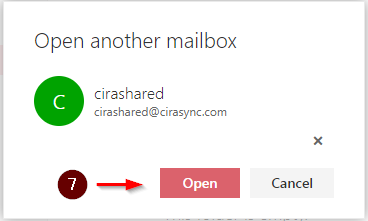 The shared mailbox will open from another browser window. You will now see the shared mailbox opened from another tab. From here you can manage the contacts and calendars easily.